Awana offers a fully integrated evangelism and discipleship programs for children that actively involve parents, church leaders, and mentors. Awana helps churches and parents work together to develop spiritually strong children and youth who faithfully follow Jesus Christ. Each week, the children, along with Calvary Bible Church volunteers meet on Wednesday nights between 6:00-7:45 p.m. to take part in various club programs and activities. Cubbies celebrate the spiritual potential of preschoolers (3- to 5-year olds) by helping them develop respect for God, His Son and His Word. 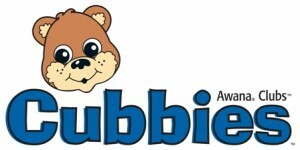 Whether it’s the fun puppets, the exciting games or all their “Cubbies friends,” they simply love it. Cubbies helps you lead your child to God early so he or she will respect and trust Him for life. Sparks ignites the curiosity of early elementary-age kids to learn about the people and events of the Bible, building a foundation of wisdom for knowing Christ. Sparks clubbers will explore the biographies of people of the Bible from a new portion of Scripture, memorize Bible verses, and complete handbook activities. Truth & Training (T&T) engages third- through sixth-graders by answering their questions about God and the Bible, guiding them through this pivotal life stage to grow in Christ’s grace. Handbooks and large-group lessons deepen a child’s knowledge about God and His Word and teach how to put that knowledge into action in everyday life.